Beloeil Castle is one of the largest, impressive and beautiful mansions in the whole of Belgium. In literal translation of the name of the castle means "beautiful eyes". For more than 800 years. 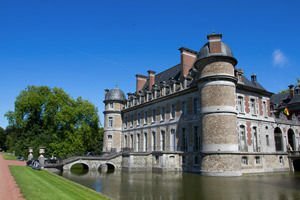 Beloeil protects its water and scenic parks in the eponymous municipality in western central Belgian province of Hainaut. Beloeil Castle sits in the middle of the beautiful baroque garden designed in the 16th century and is now open for public visits only during spring and summer from 15 May to 30 September. Into the palace is entered against the entry fee for adults 8 euros and for children and students - 5 or 5 euros. Optionally, one can pay a ticket for access to the gardens of Beloeil which is priced respectively 4 and 3 euros. The castle can be reached only by your own transport, it is situated between the villages of Mons and Ath, near the French border. Basis of Beloeil are laid in the 13th century, when it was a medieval castle with fortified rectangular building, protected by a moat and with a tower at each corner. This basic structure of the castle is still preserved, although the facade and interior have been significantly changed for centuries. At first, owners of the Beloeil Castle are princes of the family Ligne, which are settled here in 1394. This race was one of the most respected and richest in Belgium at the time. They had roots in the village of the same name, which is located eight kilometers northeast of the Beloeil Castle. Thanks to the owners, the palace enjoys a generous and rich interior decoration, it is remarkably rich collection of art objects from the 15th to the 19th century and especially with its famous library with over 20, 000 books. In 17 and 18 century Beloeil Castle been adapted to French-style mansion with the rank of Versailles and was called Chateau. The construction of the beautiful French Park started after 1664. It is impressive with its alleys made, geometric ponds and views stretching across the village itself Beloeil beyond the boundaries of the estate. A french-style park is maintained even during the 18-19 century, when English gardens were fashionable. Today, through nearly 25 hectares of the park Beloeil moves a small train, which offers visitors an unforgettable walk in it’s beautiful arrangement. In interior terms, Beloeil Castle fascinates with its authentic furnishings of 18 century, reminiscent of the magnificent Versailles. The premises of the palace can be seen in the fine furniture and art collections of its owners, and beautiful murals that had faded in the light of their age. Beloeil was completely burned as a result of an accident on New Year's in 1900, but then carefully restored by the architect Ernest Sanson.